I like to think of myself as a bit of a cycling evangelist. That doesn’t mean I give regular sermons about cycling but through this blog, my job and other social occasions I love the opportunity to share my love for cycling with others, particularly women. So here’s 10 reasons why you should think about cycling. They are in no particular order (just the order they jumped into my head). The initial list took me about five minutes to write so you can see that I’m completely enthusiastic about this subject. Please note that I haven’t called this point ‘weight loss’ because that’s not what it’s all about. Fitness is a key benefit of cycling. I’m in my forties and I’m fitter than I’ve ever been in my life. I also weigh more than I did before I started cycling five years ago, but I’m actually leaner as a result of all those hours on the bike. This is one of my favourite benefits. All the road cyclists that I know go to the café after a ride. This means you get to have a good chat and you get to eat yummy food because you’ve just ‘pre-burnt’ your calories. I don’t actually drink coffee (because I hate the taste of it) but I don’t let that stop me being part of the café culture. Hot chocolate doesn’t look that different! I know this one is a big call but for me cycling has brought me increased self-confidence. That’s because through cycling I’ve achieved physical and mental feats that I had no idea I was capable of. This has led to increased confidence in myself. As a result of cycling I’ve met hundreds of people, many of whom I now call friends. These people are both men and women, most of them live nearby but I’ve also met a few that live further afield. We (me, my partner and our new friends) even socialise long after we’ve put our bikes away and spend the odd weekend away together. I’ve never added up how much money I’ve spent on bikes, bike accessories and spare parts but it would be plenty. However, I don’t begrudge any of it, because it brings me pleasure and all the other benefits mentioned here. I’ve always loved buying clothes and accessories for work and socialising, and now I love buying colour coordinated ‘everythings’ for my cycling. As well as taking up cycling I’ve also taken up following the professional cycling scene. I keep up with the men’s and women’s pro peletons through the news media and social media and I’ve even been lucky enough to meet a few key people in the women’s cycling world. Since I took up cycling I’ve been to watch the Tour de France twice. It’s like the ideal holiday for my partner and I. We both love cycling and learning about new cultures and through cycling we’ve managed to blend the two. Tacked on to those holidays we’ve also done some more traditional sightseeing as well as the mandatory shopping in Paris. My partner and I took up cycling together and it’s given us a great opportunity to spend more time together. Like many couples, our speed on the bike is vastly different so we’ve found a riding group where they break into sub-groups according to the speed and we’re both happy. We get to ride together sometimes but also ride with our separate friends. 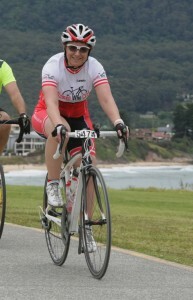 When I started cycling it was to participate in a charity ride for the Juvenile Diabetes Research Foundation (JDRF). To do the ride you need to raise $3,500 for the charity and I’ve done that five times now so I’ve raised $17,500 to help JDRF find a cure for diabetes. There are so many great charities running similar rides and I’ve made contributions to a few others along the way too. This one particularly applies if you commute to work and save money on running a car or public transport fares. As an added bonus you are no longer contributing to green house gas emissions, that’s if you previously drove a car. All great suggestions. I’m waiting for the snow/ice combo to leave Calgary and hopefully will be back on my bike at the end of the month. I have just 2 days ago cycled “3 Peaks” ride in Victoria along with 30 other females from my club Cam’s Cycle Coaching in Brisbane with total of 200 female riders out of 1800. It was an EPIC ride of 235km and 4300m of climbing. A challenge I would not have dreamed of 3 years ago, maybe a challenge way too big for some…at least start riding , who knows what you might do! I have taken up cycling for many of these same reasons. I love it, and I hope that more women will take up the sport, much like we did with running.